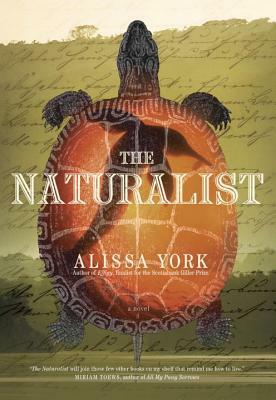 I was so excited about The Naturalist when I saw it was coming out. I mean, it has a turtle on the cover! Two years ago, her last book, Fauna, was the choice for One Book Nova Scotia, and I thought it was lovely. (My review, which was one of the first ones I wrote, so go easy on me.) Her other books have also been recommended to me by a trusted blogger. My initial reaction to this book was a case of my expectations getting in the way of my enjoyment of the story. I had my mind set on something different from the story that was written, and I wish I could go back and try again. I think too, because of the setting along the Amazon River, I was comparing it to books like Euphoria and State of Wonder, but this is a very different book. As it should be. The Naturalist is a quiet novel, filled with the descriptions of nature as it is, rather than what we imagine it could be. Like Fauna, which also has a strong emphasis on nature, I would recommend this to nature-lovers, and not necessarily to readers who like plot-driven novels. Although I didn’t find all the characters likeable, they were interesting, and their interactions with each other are deliberate and subtle, working up to the story’s conclusion, which is also quiet. It is 1867 and Iris is the widow of the naturalist, Walter Ash. Iris, along with her companion (Rachel) and her step-son (Paul), have gone on the trip that she had been planning with Walter before he died. Over the course of their trip, the characters struggle with their grief and how they fit together now that Walter is gone. Themes of nature are strong in the book, as you would expect, and it becomes clear that the true naturalist in the story is Rachel, who believes in observing animals in their own habitat, rather than catching them and taking them home to put on display. The narration alternates between Rachel and Paul; Rachel being our tie to Iris and the natural world, and Paul being our tie to the past and the longing for a place to call home. There was one thing about the book that I found distracting while reading – the frequent use of Portuguese phrases throughout the text. Being the kind of person who reads every word, I found myself trying to work out the pronunciations for all these words and phrases that I didn’t know, when there was no need. Other readers may not have this problem. A highlight/bookish coincidence: Paul often refers to Humboldt’s account of his travels in the area. This is a book I would love to discuss; the characters, the ideas, the style… I also hope to read more of Alissa York’s backlist. The book is broken up into four parts. Part 1: Lev tells us about his family; his mother who died, his father (David) who works a lot, and his sister (Samara) who he seems to be very close with. This was my favourite section of the book. Lev is a sweet, innocent boy who loves his family and would do anything to keep it together or make it better (like his attempts to hook his father up with a nice woman). That night, at dinner, Dad asked again what me and Sammy were learning in school. He wanted to know how Sammy was liking King Lear so far, but she just stared down at her skirt, so instead I just told him all about Ms. Davidson and how she went for bike rides in the middle of the night and wore happy colors and really made you think. After a few minutes, he yawned. I could tell he was extremely bored but I kept on talking because that was the only way, because if I kept on talking, word after word, drop after drop, sooner or later a space would open up. Part 2: Ten years later, David has had a heart attack and Lev and Samara are coming home to stay with him for a while. I found David to be a sympathetic and interesting character, but not a very likeable one. He really doesn’t have life figured out any more than his kids do, and instead of putting time and energy into his family, he puts it into his work. This wasn’t just a competition anymore; we were locked in a war. I went to bed shaking with rage. And, that was why, when Miriam left the house the next day and went to the grocery store to buy saltines, f*cking saltines, and got hit by a car and died, a part of me was horrified but a part of me was vindicated, was triumphant, and that was the part of my that felt like screaming from the rooftops: Yes! Yes! Exactly! Yes! That is how meaningless life can be. I had wanted an answer. But how I suddenly loved the question. Don’t see signs in everything. It makes it impossible to live. Part 4: This section is from the point of view of several of the characters from Mile End. In addition to Lev, Samara, and David, there are also a few neighbours involved in the story; their Kabbalah teacher, Mr Glassman, crazy Mr. Katz, and Lev’s long-time friend, the nerdy love-struck Alex. Will Samara and Lev be able to find a connection again; to themselves, and to each other? Mr Glassman tells a story in this section – Yankel’s story – about the Kingdom of Silence and the Word Tree. The book is worth reading just for this story alone. A book about grief, faith, family, and home. Highly recommended. 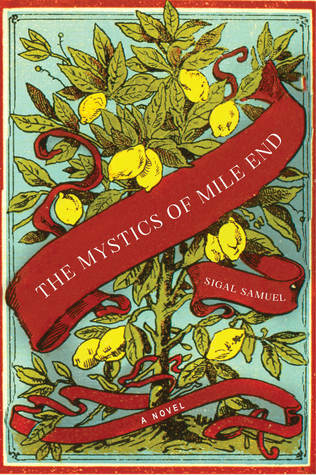 You can find a long list of both interviews and reviews of Sigal Samuel’s book on her website. I particularly recommend the interviews, in which Samuel talks about the themes of her novel as well as the connection it has to her own life/family. Both of these books are on my 10 Books of Summer list, hosted by Cathy at 746Books. These both sound right up my alley! I enjoyed your reviews. 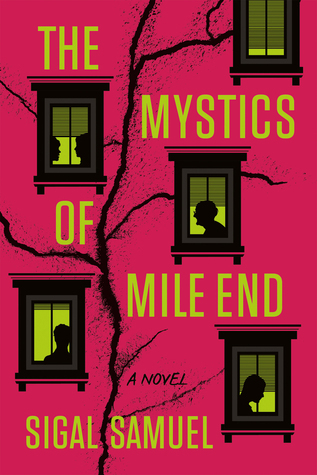 I think I’d have trouble finding The Naturalist, but I have The Mystics of Mile End on my Kindle and now just have to find time for it. Oh good – I hope you like it! The sound great, my kind of books! I’m thinking you’re the right audience for The Naturalist, Valorie! Like you needed any convincing to try more of Alissa York’s books? Well, she’s one of my MustReadEverything authors, so just let me know if somehow you do need some! This one is still on my TBR. Sometimes I get nervous about reading her stuff because she’s broken my heart on the page a few times. Thanks for pointing us in the direction of the interviews on Sigal Samuel’s site: I’m really looking forward to reading them. This was a great read for me too, one which left me with more questions than answers, and I loved it that way. I love reading author interviews, even though I don’t always get the chance. But I found these to be especially enlightening. I hope you can find a little extra time to read them! I especially loved the quote about her finding meaning in the world in fiction, both in reading and writing it. Also really enjoyed seeing the blurbs from American writers: interesting who was asked to contribute. And what a different cover. It’s beautiful, but I still do prefer the plainer Canadian one, which I felt perfectly captured some of the different states of being of the characters in the story. Thanks again. I agree about the covers! They’re both nice, though. Sometimes the fence is a comfy place to be, whilst someone else plays reading scout for you! I find words and names from other cultures to be distracting too, Naomi – certainly not a deal-breaker by any means, but I also tend to stop and look things up while I read. I also know how one’s expectations of a book can cloud the reading experience! But it sounds like you settled into a groove eventually with The Naturalist. Yes, it’s still a book that I would recommend! And it may be a good option for a re-read someday now that I know what to expect. I’m finding so many nuggets of wisdom in these pull-quotes. “Don’t see signs in everything. It makes it impossible to live.” This should be my family motto. Perhaps its a Caribbean thing, but there’s something about that implies that everything is divine intervention. Obstacles and barriers oftentimes mean something “wasn’t meant to happen,” or that it’s karma. I know what you mean! Sometimes these ‘signs’ can get in the way of forging our own lives. That particular quote really spoke to me as well. What is the work that David does? He’s a professor at the University. But don’t ask me in what, because I can’t remember now! Although it must have been theological in nature. That first cover is a dream! And I’m putting both of these on my TBR. Thanks Naomi! Love this book. I read it about a year ago, and what a surprisingly good time! And, one I think most readers would like! The Naturalist book does have a great cover but perhaps it’s too quiet a story. Hmm. I did like Euphoria and State of Wonder quite a bit. And I still need to read Lab Girl which sounds like it’s nature focused. I will get to it! Just don’t go into The Naturalist thinking it will be like Euphoria or State of wonder! That was my mistake. Lab Girl is good, too! That seems to be my leaning, as well. But now, all of you know what to expect (or not to expect)!